Volvo, if you hadn’t noticed, has transformed its entire lineup in just four short years. The process began with the 2016 XC90 flagship SUV, which introduced the new scalable vehicle architecture, family of engines, design philosophy, and driver assistance, collision avoidance, and infotainment technologies that all future Volvos would use. 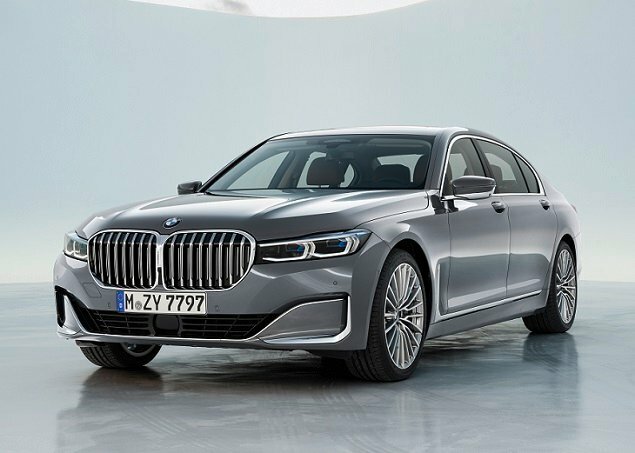 In early 2019, the process concludes with the completely redesigned 2019 S60 sedan and V60 station wagon. Another new Volvo for 2019 is the plucky little XC40 SUV. Officially the least expensive way to get into a Volvo, the XC40 is also the first model available through the company’s new Care by Volvo subscription program. Care by Volvo bundles the car payment, insurance, and all maintenance into a single monthly price. Think of it as similar to a smartphone service plan, but applied to a vehicle. Volvo offers the XC40 in T4 front-wheel and T5 all-wheel-drive variants. Each comes in standard Momentum, sporty R-Design, and luxurious Inscription trim. Numerous color, interior, and wheel selections allow buyers to tailor one to specific preferences, and each is offered with a handful of option packages and stand-alone equipment upgrades. For this review, J.D. Power evaluated an XC40 T5 AWD Momentum equipped with Amazon Blue paint, a white contrast roof, 19-inch white-spoke aluminum wheels, heated front seats, a heated steering wheel, a panoramic glass sunroof, the Premium Package, the Vision Package, and the Multimedia Package. The price came to $43,120, including the $995 destination charge. Before we discuss the results of our evaluation of the 2019 Volvo XC40, it is helpful to understand who buys Small Premium SUVs and what they like most and least about their vehicles. More women than men purchase these types of SUVs, with 54% of owners telling J.D. Power that they are female. Their average age is 54, and they earn a median annual household income of $143,042. The most commonly identify as Performance Buyers. According to Small Premium SUV owners, the three things that are most important to them are quality of workmanship and reliability (in a tie with 94% agreeing), responsive handling and acceleration (93% agree), and styling that stands out from the crowd (84% agree). They are not concerned about buying a vehicle from a domestic company (23% agree that this would be preferable), and they do not feel that a vehicle is just a way of getting from place to place (34% agree that this is true). In the sections that follow, our expert provides his own perceptions about how the new Volvo XC40 measures up in each of the 10 categories that comprise the 2018 APEAL Study. Small Premium SUV owners value quality, performance, and style. There is no question that Volvo has nailed the XC40’s exterior design. My test vehicle had a beach-buggy vibe going, with flat light blue paint, a white top, and white-spoked wheels. If that’s not your thing, try the sporty R-Design in a bright color and big 20-inch wheels. Or select the upscale Inscription version, which comes in subdued hues for a more mature look. Regardless of your choice, this is a good-looking little SUV. Front and rear it looks like other Volvos, but from the side it adopts a unique geometric appearance that works perfectly on its smaller dimensions. Trendy, appealing design continues inside, where the dashboard inlays are different for each trim level. Buyers select from four different interior colors, and with R-Design trim you can even get Lava Orange carpeting and door panel inserts. Despite this, if you’ve seen the inside of a recent Volvo, you’ll immediately recognize the XC40’s cabin. Minimalism rules, a vertically oriented tablet-style touchscreen infotainment system contains most controls and settings, elegant vertical metal vents add significant class and character, and quality permeates the cabin. This might be Volvo’s least expensive model, but when you open the door you’d never guess it. Volvo is renowned for its comfortable seats, and my T5 Momentum did not disappoint. Though the power adjustable front seats lacked ventilation, they were nevertheless comfortable, supplying a good mix of height adjustment and cushion angle. The driver’s seat even had a handy storage tray that slid forward from just beneath the cushion. Rear seat occupants are not going to be as happy, especially if they are adults with long legs. Thigh support is lacking because the bottom cushion is flat in order to facilitate a level cargo load floor when the seat is folded down. Also, leg and knee room are merely adequate, and the hard front seat backs are unkind to them. Aside from the test car’s lack of seat ventilation, the climate control system worked effectively to cool the cabin on a late summer day. Had I tested during winter in a cold climate, the heated front seats and heated steering wheel would have come in handy, along with the heated washer jet nozzles. Using the climate controls is fussy. They’re embedded with the center screen, so you need to tap to bring up the screen, carefully and accurately tap to adjust the temperature, and then tap to close the screen. Or, you can use the impressive voice recognition system to tell the car to change the temperature to a specific setting. The great thing about the XC40’s Sensus infotainment system is that works just like your smartphone does. You swipe, tap, pinch, and spread your way to various vehicle settings, entertainment selections, the navigation system, and more. You can even arrange the different tiles to your personal preferences. Trouble is, Sensus can be just as distracting to use while driving as your smartphone is. Plus, the screen collects fingerprints like crime scene squad. And when you get in, buckle up, start the engine, and reverse down the driveway, you’re in the street before the screen loads the reversing camera. Volvo provides a volume knob and tuning buttons, which makes it easy to adjust one of the most commonly changed functions in a car. Another workaround is a helpful voice recognition system, which doesn’t work perfectly every time, but is easy enough to use and, more importantly, responds quickly to requests. Alternatively, you can just connect your iPhone or Android device to the standard Apple CarPlay or Android Auto smartphone projection system, and use that instead of Sensus. The test car also had the premium Harman Kardon audio system, which is impressive. If sound quality is important to you, this upgrade is worthwhile. Between the center armrest and cup holders, there is a rectangular shape with rounded corners stamped into the console plastic. When you push on it, it opens, revealing a small trash receptacle that is easy to remove and clean. This detail perfectly represents Volvo’s thoughtfulness throughout the XC40. Unlike many small SUVs, the XC40’s cargo area is reasonably accommodating. Official measurements, according to multiple automotive publications, are 20.7 cubic-feet behind the rear seat and 47.1 cu.-ft. with the rear seat folded flat. Volvo says maximum capacity is 57.5 cu.-ft. without providing a number for just the trunk. Forward visibility is good, and large side mirrors with available blind spot warning indicators are helpful, but rear visibility is problematic due to how the rear windows taper upward and because there are no rear quarter windows. This, combined with the slow-to-load reversing camera, is cause for frustration. Volvo’s traditional commitment to occupant safety makes the company’s City Safety low-speed forward collision warning; pedestrian, cyclist, and animal detection; and front and rear automatic emergency braking system standard equipment for all XC40 trims. Driver Alert Control is also standard, monitoring for a sleepy or otherwise impaired driver. Several lane keeping assistance systems are also standard for the XC40. A Lane Keeping Aid system warns the driver when the SUV wanders out of the lane and can steer the XC40 back into the intended lane of travel. An Oncoming Lane Mitigation system helps to prevent the XC40 from wandering over the road’s center line and into the path of oncoming vehicles. A Run-off Road Mitigation system aims to prevent unintended departure from the paved surface. 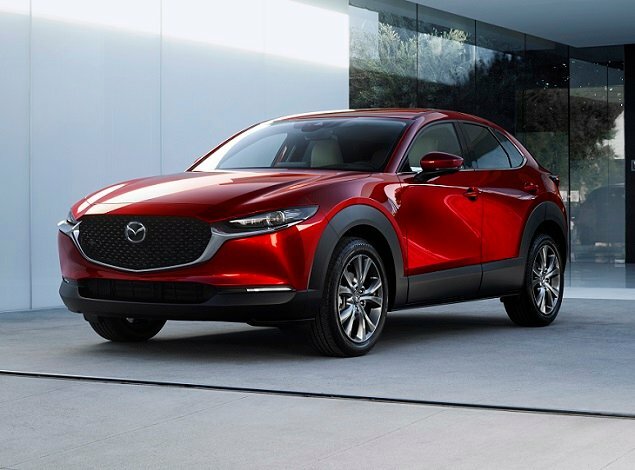 Optional for all trim levels, a blind spot monitoring system includes rear cross-traffic alert. There is also a Pilot Assist semi-autonomous driving system that installs adaptive cruise control and lane centering assist. Should all of this technology fail to prevent a collision, the XC40 has a standard post-collision automatic braking system that is designed to bring the SUV to a halt as soon as is possible in order to avoid secondary crashes following initial air bag deployment. Volvo’s OnCall service is also aboard the XC40, and is free for four years, providing access to emergency services if necessary. Every XC40 is equipped with a turbocharged 2.0-liter 4-cylinder engine and an 8-speed automatic transmission. In the T4 model, it drives the front wheels and makes 187 horsepower and 221 lb.-ft. of torque. In the T5 model, it drives all four wheels and makes 248 hp and 258 lb.-ft. of torque. The R-Design adds paddle shifters for manual control over gear changes. My test vehicle was a T5 AWD. The transmission’s gear selector is silly, requiring two pushes to engage Reverse, two pulls to engage Drive, and the push of a button for Park. If you forget to properly push or pull, you can easily wind up in Neutral. And don’t try to back this SUV up with the door open; it slams on its own brakes if you try. The T5 AWD’s maximum torque doesn’t arrive until 1,800 rpm, and if you’re in Eco or Comfort mode the transmission behaves in leisurely fashion. So yes, there is some turbo lag. Dynamic sharpens response, but doesn’t eliminate it. Once you’re riding the wave of torque, the XC40 T5 is downright quick. You won’t have trouble merging onto fast-flowing freeways, zooming past slower vehicles, or maintaining speed on hills. The EPA says the XC40 T5 AWD should get 26 mpg in combined driving. On the testing loop, the test vehicle averaged 22.7 mpg driven primarily in Comfort mode. In T5 AWD Momentum trim, the XC40 is decent to drive. It is reasonably smooth, reasonably quiet, and reasonably responsive. You’ll enjoy it most in urban and suburban environments, gently winding country roads, or on the freeway. Light off-roading is possible thanks to AWD, 8.3 inches of ground clearance, and an Off-Road driving mode. Like other Volvos, the steering is light and effortless, but also a little disconnected in terms of feel. All-season tires mounted to 19-inch aluminum wheels are perfect for everyday driving, but limit outright handling capabilities on twisty mountain roads. The test vehicle’s braking system did not respond well to repeated use in the mountains, heating up and causing vibration, but were otherwise fine. 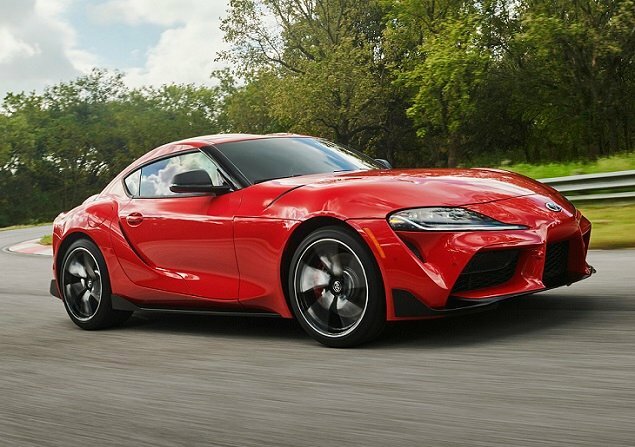 If you’re seeking more driving excitement, consider the R-Design, which includes a sport-tuned chassis and is available with 20-inch wheels and performance-oriented tires. 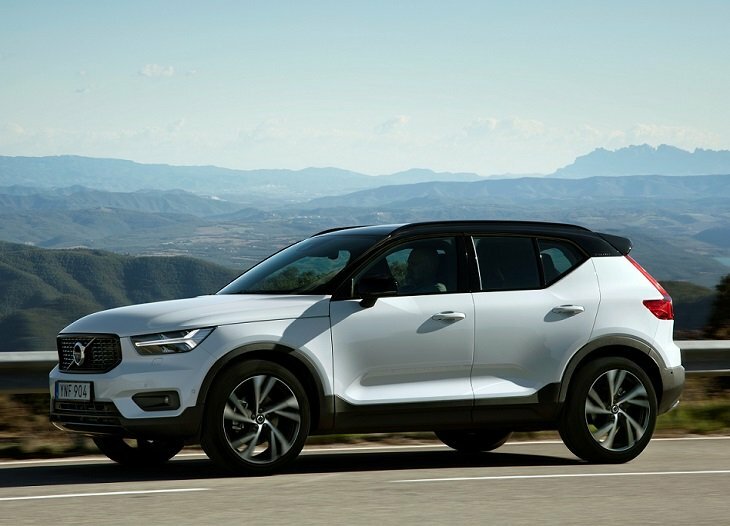 The new 2019 Volvo XC40 blends modern style with plenty of practicality, all wrapped up in a high-strength steel safety cage fortified with the latest driver assistance and collision avoidance technologies. Combine these traits with turbocharged power and pleasant driving dynamics, and Volvo has created a Small Premium SUV that should appeal to the buyers in this segment.